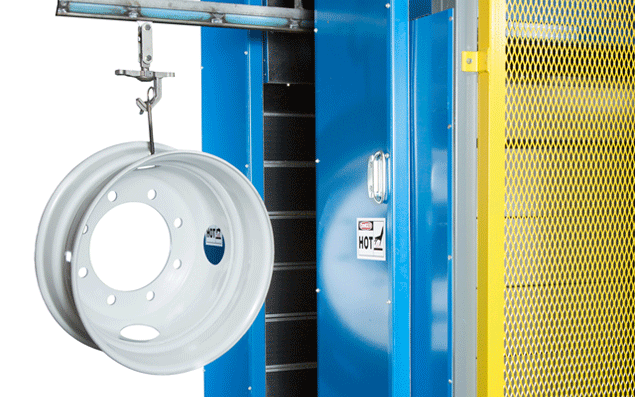 CHAMBERSBURG, PA, July 21, 2014 — IMI has announced the launch of a new infrared wheel refinishing oven that offers increased wheel coating cure efficiency. The oven’s improvements provide dealers with increased profitability, better throughput and less maintenance. The oven boasts 30 percent more power and achieves 20 percent more throughput, completing a wheel every 4.5 minutes instead of 6 to 7 minutes. This marks a significant improvement over the prior model and over competitors’ ovens while dramatically increasing system profitability. The oven has also been redesigned to provide easier setup and operation, with improved and streamlined wiring configurations and simpler controllers. It fits into IMI’s wheel refinishing process and meets TMC and OSHA standards. “With this new infrared oven, IMI continues to improve the automated wheel refinishing process that we introduced to the industry thirty years ago,” said Fogal. “Ultimately, this oven provides more profitability and a better customer experience for our commercial tire dealers and fleets. Read more about IMI’s innovative wheel refinishing system.